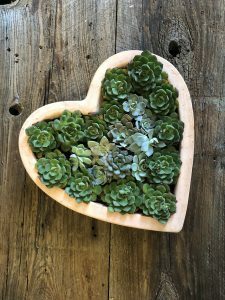 This beautiful hanging succulent planter is perfect for Valentine’s Day or just for fun. Fill this extra large, 13″ terracotta planter with your choice of succulents. Display it on a table or hang it on a wall. The cost is $80 per person. Buyer’s Club members get 10% off! Join us as we walk you through the Japanese planting style, Kokedama. Choose three plants and turn them into beautiful hanging art! The cost of this workshop is $60. This includes all instruction and materials for three Kokedama. Buyer’s Club members get 10% off!